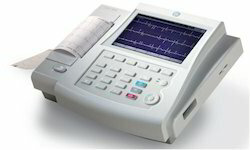 We offer wide range of Testing Instruments. Our reputation in the market is largely attributable to our precision-designed Carbon Residue Apparatus (Conradson). It is useful to determine amount of Carbon Residue when oil is evaporated under specified conditions. These are useful in the processing of various lubricants. The apparatus consists of spun sheet iron 25 cc capacity, sheet iron hood and sheet iron block on a stand, gas burner. Besides, unique quality and precise functioning increase the demand of our provided apparatus in the market. It is made as per IP 13, ASTM D-189 specification. It is useful to determine amount of Carbon Residue when an oil is evaporated under specified conditions. The carbon residue values of crude oil, residuam etc. These are useful in the Manufacture of various lubricants. The apparatus consists of spun sheet iron 25 cc capacity, sheet iron hood and sheet iron block on a stand, gas burner. Riding on unfathomable volumes of industrial expertise, we are offering an excellent range of Cleaveland Flash Point & Fire Point Apparatus. This apparatus is used for determination of flash point and fire point of petroleum products except fuel oil. This apparatus is manufactured making use of excellent grade components as well cutting-edge methodology by our adept professionals. To ensure its quality, this apparatus is strictly tested on various measures by our controllers. Being a client-centric organization, we are engaged in offering a distinct collection of Abel Flash Point Apparatus. 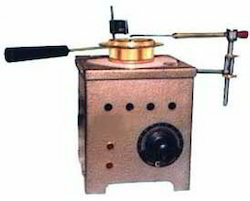 This apparatus is suitable for determining the close cup flash point of petroleum and mixtures according to IP 33 and IP 170 and also IS 1448 (Part I) 1985 (P: 20). It is suitable for oils whose flashes below 700C. 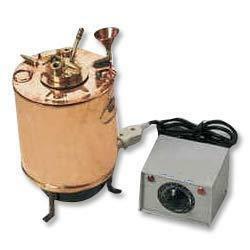 It is supplied with oil cup, cover fitted with stirrer, thermometer socket S.S. Water Bath, Stand. An electric heater is fitted at bottom for operation on 220 Volts AC Circuits. PENSKY MARTEN FLASH POINT APPARATUS : This apparatus is made as per IP 34, ASTMD-93 and IS 1448 (Part 1) 1270 (P.21) and IS 1209-1953 method B. 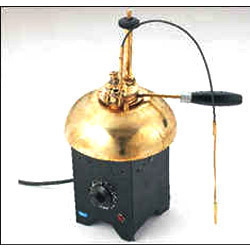 The apparatus consists of brass test cup with handle removable Cup cover with spring operated rotating shutter having oil test Jet/Gas Test Jet Flame Device, stirrer with flexible shaft. The assembly rests in air bath which is covered with Dome shape metal top. The cup is fitted with insulated handle and locking arrangement near cup flange. The assemble is kept on round shape electric heater with temp. regulator. Suitable for operation on 220 volts 50 cycles AC circuits. Looking for Testing Instruments ?